Wesley Boyd Rimmer, 36, of Kinnakeet, NC, left his loving family and friends to be with his Lord and Savior, Jesus Christ, on January 14, 2019. He leaves behind his loving mother April Rimmer of Kinnakeet, and father Franklin Rimmer of Virginia Beach. “The Aunts” Donna Funkhouser and her husband Danny, Ame Virgo, and Joni Horine and her sons Zak and Josh, and his Uncle Jeff Rimmer and his wife, Evelyn. He also leaves his beloved cat Cameron, as well as an extensive island family. Wes was loved by everyone for his quick wit, kind heart and hard work. 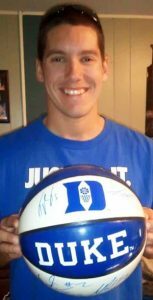 He was an avid Duke fan, and enjoyed boogie boarding, skateboarding and spending time with his family and friends. His generous nature extended to being an organ donor, and his heart will beat for another. A celebration of Wesley’s Life will be held at 1 p.m. on Saturday, January 19, 2019 at Avon Fire Station. In lieu of flowers, donations can be made in Wesley’s memory to Friends of Felines – Hatteras Island http://fofhi.org.